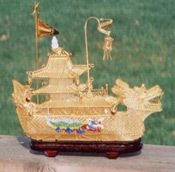 On June 10, 2006, the 2nd Annual Kansas City International Dragon Boat Festival was completed and very successful. The Ceremony began with Mr. John Phillips, Vice President of The Society for Friendship with China, introducing Mayor Pro Tem Alvin Brooks of Kansas City, who delivered opening remarks. Mr. Phillips told the audience that the Dragon Boat Festival is to raise funds and make all community members aware of our Society's major project: to build a Chinese Garden in Swope Park in the near future. The culture performances began with lion dance by Randy Li's School of Wing Chun followed by dragon dance by Tai Chi Studio and folk dances performed by KCCNA dance team. Other local groups and individuals joined the celebration as well. Attendance is estimated at about 500 people. Three teams competed in the Dragon Boat races. Two races were first held and the winners of the first two races competed in the final. The Sheraton team rowed against the better rested but average 20 years' older team of the Plaza Rotary Club to fight for the champion. The Plaza Rotary drew upon their experience of last year and won the final. It is estimated that over 600 people watched the races. An award banquet held at Bo Lings was attended by all contestants and the event planning committee members. Below images are taken by Dan Gilbert during the Festival. Click on the image for a larger view. Copyright 2006-2008 The Society For Friendship With China, Inc. | All right reserved | Photos by Linda Hanley | Website designed & maintained by ZJS Designs.